Streptococcus pyogenes is not a bacteria that should be taken lightly. Many people carry the bacteria without incident, however it has the potential to cause both mild and severe diseases. Streptococcus pyogenes has claimed many lives, including that of Muppet's creator, Jim Henson. While most people will only suffer from mild infections, such as strep throat or impetigo during childhood, it is important to understand it's full pathogenic potential to understand how to identify, treat, and avoid these infections. 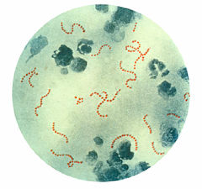 Characteristically, Streptococcus pyogenes is a Gram-positive facultative anaerobic bacterium. It is not motile, and does not produce spores. It occurs as long chains of cocci, and occasionally in pairs. Streptococcus pyogenes is classified as Group A streptococcus. Group A streptococci typically have a capsule composed of hyaluronic acid and are beta-hemolytic, which is true for Streptococcus pyogenes. Beta-hemolytic streptococci produce a toxin that forms a clear zone of hemolysis on blood agar, demonstrating its ability to destroy red blood cells. This hemolysis is attributed to toxins formed by Group A streptococci called streptolysins. Streptolysins can destroy not only red blood cells, but also the white blood cells responsible for fighting off bacteria and disease, as well as other body cells. Several factors add to Streptococcus pyogene's ability to cause disease. These factors include its production of exotoxins and streptokinase, the M proteins on its surface, and its hyaluronic acid capsule. Streptococcus pyogenes produces three types of exotoxins. These toxins are responsible for causing fever and scarlet fever rashes; they also increase the risk of endotoxic shock and depress antibody synthesis. Streptococcus pyogenes also produces streptokinase, a toxin that digests blood clots to assist in the invasion of wounds. The cell wall of Streptococcus pyogenes contains M proteins, which are a major factor behind its virulence. M protein is heat and acid resistant, it aids in the attachment to host tissues, and helps the cell to resist phagocytosis. Host immunity to Streptococcus pyogenes results from the development of antibodies specific to M protein. The hyaluronic acid capsule of Streptococcus pyogenes is chemically similar to human connective tissue, which allows it to go unrecognized as an antigen by the host's body, further helping the bacteria to avoid phagocytosis. Streptococcus pyogenes can be considered an opportunistic pathogen. It is part of the normal flora of the respiratory tract in many people, but usually does not cause complications until the person's natural defenses to disease compromised. Streptococcus pyogenes is somewhat unique in that it does not cause just one disease, but is capable of causing many different diseases. These diseases range from mild, like strep throat and impetigo, to severe, like necrotizing fasciitis, and streptococcal toxic shock syndrome. Streptococcus pyogenes is the most common bacterial cause of sore throat. A painful, red throat with white patches on your tonsils is characteristic of pharyngitis, otherwise known as strep throat. It is usually accompanied by swollen lymph nodes, fever, and headache. Occasionally it is also accompanied by nausea, vomiting, and abdominal pain. Strep throat can be diagnosed by a doctor through a throat culture or a rapid strep test. If left untreated strep throat can lead to further complications, including scarlet fever. 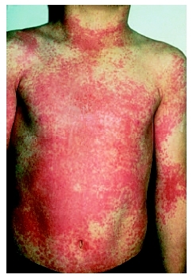 Scarlet fever is characterized by a red rash on the chest that may spread to the rest of the body. The rash has a sandpaper-like texture and appears as tiny red pinpoints. It is caused by the exotoxins produced by Streptococcus pyogenes. Scarlet fever is mainly seen in children under ten and can easily be diagnosed by a doctor by the appearance of the rash. Impetigo is another ailment caused by Streptococcus pyogenes that is common among children. Impetigo starts as a red sore and form crusty sores after a few days. The sores most commonly occur on the face, but can also be found on the extremities. They usually itch, but are extremely contagious though direct contact, so scratching the sores could spread the infection throughout the body. A doctor can easily diagnose impetigo through a visual examination of the sores. Cellulitus is an inflammation of the skin and deep tissues that can be caused by Streptococcus pyogenes. Cellulitus begins when Streptococcus pyogenes infects the site of a minor injury, such as a bruise, burn, or wound. It causes the skin to turn red, widespread pain, swelling, and tenderness of the infected area. Other symptoms include fever and chills, swollen glands, blistering of the skin, and malaise. Necrotizing fasciitis is a rare, but very serious infection caused by Streptococcus pyogenes that is popularly termed "flesh eating bacteria". The bacteria typically enters the body through a minor trauma or surgical wound in persons of compromised immune systems and causes and infection just below the skin that spreads to deeper tissues. Necrotizing fasciitis is an extremely quick moving infection that is characterized by the rapid destruction of tissue. It is fatal in 30-40% of cases. Streptococcal toxic shock syndrome is another very serious disease caused by Streptococcus pyogenes. It is not the same as the toxic shock syndrome associated with tampons, which can be attributed to Staphylococcus aureus. Streptococcal toxic shock commonly occurs in healthy individuals following an initial infection of Streptococcus pyogenes. Symptoms include significant pain, swelling, and redness of infected area, fever, dizziness, difficulty breathing, dangerously low blood pressure, and a weak, rapid pulse. Medical care is crucial as more than 50% of cases of streptococcal toxic shock develop into necrotizing fasciitis or myositis, and there is a 30-70% mortality rate. Diseases caused by Streptococcus pyogenes usually respond well to antibiotic treatment. The American Heart Association and the Infectious Diseases Society of America currently recommend penicillin as the drug of choice for treatment. In severe cases, such as with necrotizing fasciitis, surgical removal of the infected tissue may be required. Streptococcus pyogenes is most often spread through contact with mucus or wounds of infected individuals. Due to this, thorough hand washing is a good way to reduce the risk of becoming infected. The Center for Disease Control recommends that persons with streptococcal infections stay home from work, school, or day care until they have been taking antibiotics for at least 24 hours to reduce the risk of transmitting the infection. 2. Tortora G, Funke B, Case C. 2007. Microbiology: An Introduction, 9th Edition. Pearson Education, Inc.